In the classic comedy movie Dracula: Dead and Loving It, Mel Brooks’ character Dr. Abraham van Helsing orders massive amounts of garlic to be placed in the bedroom of the young and nubile Lucy (played by Lysette Anthony) after tiny puncture marks have been found on her neck. A competing doctor played by Harvey Korman orders the garlic removed from Lucy’s boudoir, and the next night Count Dracula emerges from an insane asylum and uses hypnotic mind control to lure Lucy to a nearby garden, where she meets a ghastly fate. Garlic does not help fight acne. Garlic is often portrayed as a magical tool with the power of preserving life from the forces of death. For centuries, garlic was used to protect skin from the ravages of acne. But if you don’t use garlic, will the acne vampires glamor and lead you to skin destruction? Garlic is used in traditional skin care to stimulate growth of hair rather than to treat acne. Scientific tests have shown that tea tree oil and wild basil oil fight acne, but garlic does not. Garlic eaten as a food may modify the immune system in ways that reduce acne inflammation. Other botanical ingredients are much more useful for acne-prone skin than garlic. Sandalwood oil offers some benefits not found in other botanical treatments for blemished skin. A complete acne treatment system is much more useful in treating acne than garlic. Drs. Karen Martin and Edzard Ernst of the Universities of Exeter and Plymouth in the United Kingdom did a comprehensive study of the antibacterial properties of common herbal preparations. They found that tea tree oil and wild basil oil kill acne bacteria. Although wild basil (Ocimum gratissimum) oil is seldom found at the natural products store, Dr. Ernst’s experiments found that 5% wild basil oil was more effective for getting rid of pimples than 5% benzoyl peroxide—and it also smelled so bad that it drove away bugs. The authors also found that black tea extract was useful in treating skin infections—but for garlic, no such evidence was to be found. There is nothing in garlic that is known to kill acne bacteria, or another kind of bacteria on the skin, for that matter. Does that mean that garlic treatment for acne is a waste of time? Garlic is a traditional skin treatment in Unani medicine, still used in Turkey, Iran, Pakistan, and Kashmir. Traditionally garlic is used to stimulate growth of the skin after inflammation or infection. More specifically, garlic is used to stimulate growth in hair follicles rather than in sebum-producing follicles. When alopecia areata has made hair fall out, or acne keloidalis nuchae has trapped hair in pores, garlic is applied to the skin to correct the problem. Unani physicians in India have conducted clinical trials that have found that garlic enhances the effects of steroid drugs in treating these kinds of skin problems. If you have acne keloidalis nuchae, chances are you will prefer treatment with topical tretinoin to rubbing garlic on your head. 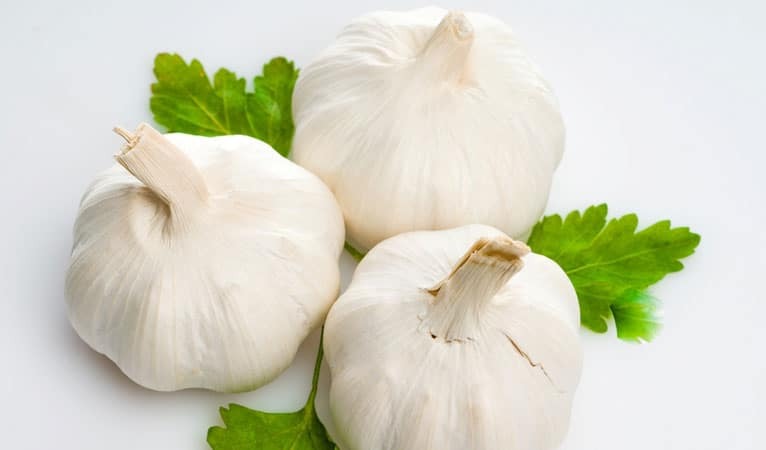 However, garlic tablets may have some usefulness in stimulating the immune system to deal with acne infections from the inside out in healthy ways. Stimulating the immune system generally is not something you want to do if you have acne. The inflammation and irritation that make the skin break out are caused by the immune system itself rather than by acne bacteria. Acne bacteria trapped deep inside pores can be killed by the byproducts of consuming the sebum on top of them. As the acne digest the waxy sebum, they release n-3 essential fatty acids that nourish the skin but that are toxic to bacteria. Acne bacteria cannot eat their way free of the skin. The way acne bacteria eventually escape the pore is by releasing chemicals that make surrounding skin cells more sensitive to inflammation. When the immune system attempts to kill the bacteria by releasing histamine and interleukin-8, it kills some of the bacteria, but it also kills some of the skin cells around them. Eventually, some bacteria escape the pimple as it heals, and wait to be transferred to another pore so they can go back to their task of consuming excess sebum. When you eat garlic, you don’t stimulate the immune system to attack your skin. Instead, you give your immune system something else to do. The chemicals in garlic that give it color and flavor are lectins that can cause irritation in your stomach. The immune system sends white blood cells to the villi, or collection points, of the large intestine, that release antibodies to destroy the garlic lectins. Since the digested garlic does not put up a fight, the immune system learns that fewer antibodies are needed to get rid of an infection, and this learning can be transferred to the immune system in the skin. That’s a lot of effort, however, for a very indirect benefit to the skin. Rubbing garlic on your skin will have no effect at all—other than fewer people will notice your blemishes because the smell will make them run away. There are other herbs that are better for treating acne on your skin. Tea tree oil is great for getting the red out of pimples, and it also kills acne bacteria. Use pure tea tree oil or products that contain at least 10% tea tree oil directly on blemished skin. Redness should begin to clear up within 24 hours, and acne bacteria will be killed in about 72 hours. It make take as long as two weeks for new, unblemished skin to come in. Never take tea tree oil or any other essential oil by mouth. Sandalwood oil can be dabbed on an oozing pimple. It stops the flow of pus and moisturizes the skin around the pimple so other treatments can reach deeper into the skin. Don’t use more than once a day, or more than three days in a row. Thyme oil provides an antibacterial effect comparable to clindamycin and erythromycin creams on acne-prone skin. It’s the active ingredient in Listerine, so if budget is a problem you could also just use a clean cotton swab to dab alcohol-free Listerine on a blemish to disinfect it. Be sure to dip the clean swab in Listerine only once and to throw away after use. Garlic is not a whole lot more useful for fighting acne than it is for fighting vampires. A complete acne fighting system, however, may be exactly what you need and Exposed Skin Care comes with a complete money back guarantee.